I'll like to extend the functionality of the default Media Library, right now Im able to upload image files and it render them properly ( I can see a thumbnail of the image when Im selecting it from the Media Selector ) but if I try uploading an SVG image file I will only get a white square. Currently Image files get a tag and display the thumbnail with no problema, but if an svg is uploaded media library will use an tag. 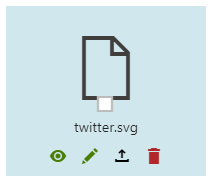 How can I do a proper render of this svg to show in the Media Library and in the Media Selector (basically use instead of icon tag? Im not sure, BUT You can try edit MediaView.aspx.cs(/CMSModules/MediaLibrary/Controls/MediaLibrary/MediaView.ascx) file at line no : 799. Ey guys thanks both for your help!! Definetly what I needed !